If you are a bodybuilder or a sportsperson keen on more lean muscle, but are bogged down by stubborn body fat- we suggest you try whey protein for weight loss. Let’s find out more about how whey protein supplements help you lose weight and help you to bulk up simultaneously. Whey protein is a milk protein that is a by-product of cheese production. Whey is worth its weight in gold for fitness aficionados as it contains more branched-chain amino acids or BCAAs than any other source of protein and it’s abundant in the super amino acid leucine which helps muscle gain by initiating protein synthesis in cells. Whey Protein Concentrate: This contains some fat and lactose sugar apart from 29% – 89% protein. It also has more bio-active compounds which help in quicker absorption of amino acids by your body as compared to the isolate form of whey. Whey Protein Isolate: This type of whey protein supplement contains small quantities of fat, cholesterol and lactose and 90% or more protein. It is the most recommended type of whey, especially if you want to lose weight and get more lean muscle. Whey Protein Hydrolysates: These are pre-digested and partially broken down whey protein and therefore easier to absorb by your body. Does the bodybuilding supplement whey protein help you shed body fat? The answer is a big fat “yes”. But, with a caveat- Whey is not a miracle weight-loss food. In fact, no food or supplement on this whole earth is! Having said that, whey can help you slim down and develop more lean muscle mass only if you are in a calorie deficit state which means you are burning more calories than you consume and are strength training. Whey protein is rich in Leucine: Leucine is a branched-chain amino acid and it plays a key role in protein synthesis, an anabolic process that burns quite a few stored calories. In addition, leucine also stimulates fatty acid oxidation. It’s easily absorbed: Post or pre-workout, whey is exceptional because of its highest protein digestibility corrected amino acid score (PDCAA). This is a measure of both how well a protein is digested in the body and how well it supplies the amino acids needed for muscle building, read leucine. Whey protein can be taken anytime, but it’s very effective as a post-workout source of protein because it’s digested and absorbed rapidly, which causes a dramatic increase in amino acids in the blood, especially leucine. Research has proved conclusively that this stimulates immediate muscle growth as compared to other slower-burning proteins like casein. It helps in superfast recovery and regeneration of muscle which allows you to bounce back sooner. Whey gives you a feeling of satiety:This happens because of the presence of glycomacropeptide – a peptide that stimulates CCK an intestinal hormone that is released after eating a meal to signal satiety. Studies prove that whey satiates your appetite better than most other types of protein and it may also help you control hunger, according to a 12-week-long 2014 study published in the European Journal of Clinical Nutrition. Whey helps retain muscle tissue and thus aids in sustained weight loss: According to a 2008 study published in Nutrition Journal, whey protein meal-replacement shakes help in losing more fat than muscle in a group of overweight and obese individuals following a reduced-calorie diet. And muscle burns more calories than fat tissue (6 calories per pound versus 2 calories per pound, respectively). When you lose weight, you lose both muscle and fat, which causes your metabolism to slow down and makes it harder for you to lose weight beyond a point. This is where whey helps. It prevents muscle loss, which may make it a little easier for you to continue to lose fat and not plateau after a point. Whey protein is ideal for weight- loss because it is low in carbs, fat and calories and it can be had by lactose intolerant individuals as well because most of the lactose has been stripped. Which Whey for Weight Loss? You can choose between a whey isolate and a whey concentrate for losing weight. Whey concentrates are about 80% protein and are one of the most economical per gram of protein. This makes them very popular amongst most bodybuilders. Whey isolates are about 90% protein, and this makes them even lower in fat, carbs and lactose. This type of whey protein is ‘liquid-y’ and has a cleaner taste; but on the other hand, it’s also more expensive than whey concentrates. You can go for whey protein shakes too. But before you do, pay attention to the total calories per serving. If you’re trying to lose weight, calories from any source count, so remember calories from a whey protein shake will add into your daily total. 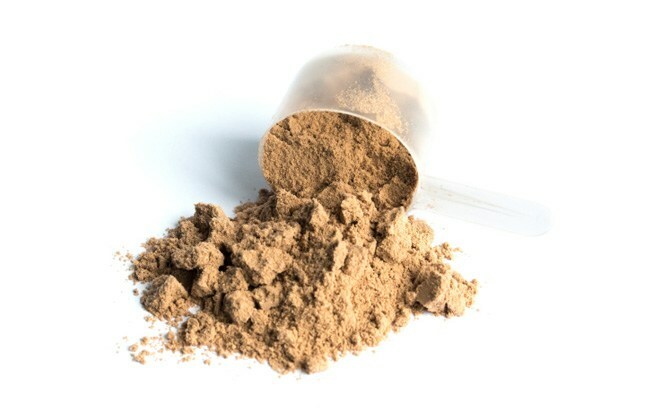 Calories and protein vary from brand to brand in whey protein supplements- some popular whey shakes have 110 to 170 calories and 24 to 28 grams of protein per scoop. So, choose the one with lower calories for weight loss. It’s also beyond important that you take a look at the breakdown of macronutrients in your whey supplement. This means you must look at the ratio of proteins to carbohydrates to fats on a per serving basis. Experts recommend that you pick up a supplement that contains less than 5 grams of carbohydrates and less than 2 grams of fat per serving. It gives you 25.6 g protein in every 32 g serving of the unflavored powder and additionally it doesn’t contain fillers, thickeners or cheap amino acids added to reduce the quality of the product. It’s also available in popular, mouth watering flavours to suit your taste. How to use Whey Protein for Weight-Loss? You can use a whey protein powder in a smoothie for breakfast. Try to create a blend using water or milk, protein powder, and fruit and or vegetables so it is both nutritious and filling for the workout ahead. A 1,800-calorie whey protein shake diet plan for women can be used to replace two meals, such as breakfast and dinner. To keep your calorie deficit down, fill out the rest of your day with low-calorie, nutrient-dense snacks like raw vegetables or nuts and take care to incorporate lean protein, whole grains and fresh vegetables in your meals. Whey protein increases satiety so you can replace it with a snack to help feel full for longer. So, add a whey protein powder to milk or juice mid-afternoon to feel full. Indeed, whey protein for women’s weight loss is unbeatable. According to the Academy of Nutrition and Dietetics and and the American College of Sports Medicine recommendations, female trainers and athletes should consume 1.2 to 1.7 grams of protein per kilogram of body weight daily. You can easily get this amount of protein by substituting a meal with a whey protein supplement. Whey protein shakes for women’s weight loss are a great way to get enough proteins for lean muscle mass and also cutting down extra calories in whole foods. Know this that as a woman you will never make muscles like men body builders do because you just don’t have enough testosterone in your body. You will develop a stronger body with firmer curves and healthier body mass, though. There is a glut of diets that use whey supplements as a substitute for real food. We suggest you try them out for maximum of three months at a go. This is because supplements can’t rival real food which gives you the macros to live healthy for longer. Whey protein shakes are a great way to prevent over-indulging in all the wrong sorts of foods. 30 minutes before or after your workouts as whey has been shown to help with muscle development and recovery. 30 minutes before meals or dinning out. This will help you feel full so that you don’t overindulge in fatty foods. What to Eat with Whey Protein for Weight Loss? Water is great to mix with whey protein supplements for weight loss. Unsweetened nut milks like cashew, almond, and coconut work well too. It’s best to avoid using milk because it has a good amount of sugar. You can add whey powder in oatmeal, Greek yogurt, and smoothies for a nutri-boost. This will add a dash of taste to otherwise bland healthy foods. If you have more questions about whey, feel free to ask us. Just post your comments and questions in the comment section below and we shall be prompt with the answers.